I opened our “Places, People, & Prayers 2009” blogs in a long distant past (well, May 1 to be precise!) with an account from Jerusalem on our first night in the Holy Land. Time always seems to balloon when one travels far away from home and regular schedules. And by my reckoning, we could easily have been gone months, rather than the 3 1/2 weeks that stretch from Thursday, April 30, to Saturday, May 23. But our trip is now history, so far as the travel of it is concerned. 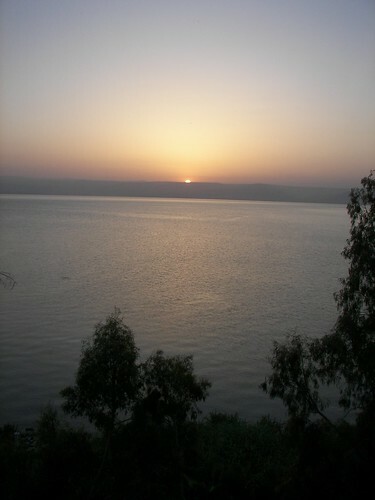 And now here I am once again, with “a few last words” about our concluding days of touring . . . .
From Wednesday, May 20, through Friday noon, May 22, we made our home on the shore of the Sea of Galilee, at the YMCA just north of Tiberias. Here we had stunning views morning by morning of the sunrise over the Sea. (It’s enough to take your breath away. But don’t trust me. Go, see it for yourself!) The peacefulness of this setting was profoundly nourishing to our spirits after the emotional challenges of our time in the West Bank in previous weeks. Here we could sit just above the beach, facing the water, for our regular Evening Prayers. And here we could eat our breakfasts and dinners in the open air with a stunning view of the Sea in front of us. What a gift! Thursday was our trip to the “north.” Days before we had traveled to the “south” (the Negev desert), to Beersheba, where it was all dry and brown and barren. Now we traveled to the other end of the biblical “Land of Israel” (“from Dan to Beersheba”) to Tell Dan, at the headwaters of the Jordan River. Here everything was lush and green. 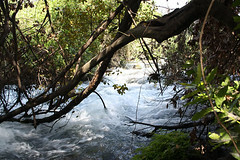 And here the water rushed furiously along its little stream on its way into the Jordan. From Tell Dan we traveled on to Caesarea Philippi (known also as Banyas, for the temple built there to the god Pan), where Jesus questioned his disciples about his identity. Here, on the site of a large complex of pagan temples built up against a huge cliff, we pondered the words of Jesus (“But who do you say that I am?”) and the confession of Peter (“You are the Christ, the Son of the Living God.”). In the afternoon we hiked from Banyas to a beautiful waterfall before boarding our bus for a drive through the Golan Heights. Here we caught a glimpse of Mt. Hermon, with its snow-covered peak, witnessed the ruins of a Syrian military camp from 1967, and looked across a great wide plain past a UN border camp into Syria itself. And here we stopped to buy fresh cherries at a Druze village near to the Syrian border. 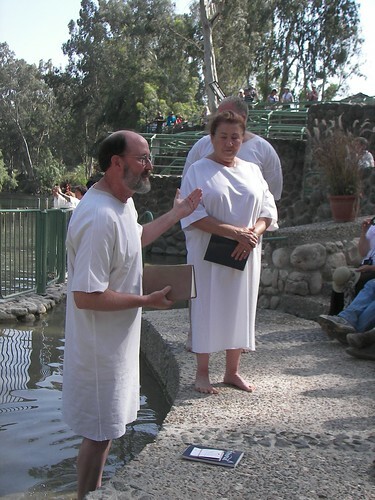 But our most significant stop of the day was at Yardenit on the southern edge of the Sea of Galilee, the “baptismal site” at the spot where the Sea of Galilee opens into the Jordan River. Here we witnessed, joyfully, the baptism of Marilyn Gerlach and the immersion of Curtis Wheeler in remembrance of his baptismal vows. This was truly a day for “living water”! On Friday we closed out our time together with a morning of retreat–a time of worship, silence, journaling, shared reflections, and a Communion service by the Sea of Galilee. After lunch at a nearby restaurant (St. Peter’s fish, complete with their smiling heads on the platter! ), we headed south to Caesarea Maritima for a short stroll along the beach at the Mediterranean. We had now gotten our toes (at very least) into the Dead Sea, the Sea of Galilee, the Jordan River, and now the Mediterranean. And from Caesarea we headed south and east to Abu Ghosh (one of three different “Emmaus” sites!) for our final night before our trip home. Here we were housed at the Sisters of St. Joseph, a stunningly beautiful setting high on a hill. And at 1:00 AM on Saturday, May 23, we boarded the bus for our trip to the airport . . . . It has been a rich experience–and a stretching one as well–in all kinds of ways. And now that we are home, we can begin to “unpack” all that wealth of experiences, both the happy ones and those that stretched us far beyond our comfort zones. We give thanks to God for all that we have lived and learned in these past weeks. And we give thanks to all of you for your prayers as we traveled. Blessings to all of you who have been following our travels! Perhaps such a journey could be yours in future . . . .